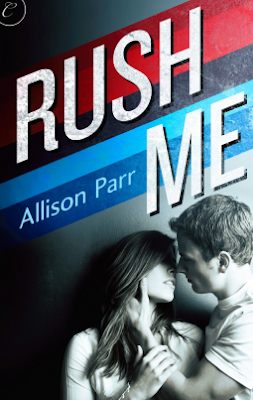 Allison Parr's debut new adult romance is absolutely amazing! Rush Me is a refreshing contemporary novel that will have readers immediately wrapped up in the lives of its characters. Rachael is a saucy lead with a determined outlook on life. She wants to make it in the publishing industry and she has plans to stick with her unpaid internship until she finds her dream job. Ryan is is the misunderstood and underestimated pro football player that gets under Rachael's skin and will charm every reader. I enjoyed every second of reading Rush Me. The plot is realistic and at the same time it's a storyline that will make you think it could only happen in dreams. Parr manages to bring Rachael and Ryan together even after their relationship started on rocky grounds. With a pacing smooth as butter and a high emotional drive, Parr has created a very engaging and entertaining story. Between the characters with quirky characteristics and vulnerabilities and the fantastic romance, Parr will gain fans something to talk about. Many stories have been published under this newly popular genre but not all of them have that spark of connection, like Rush Me. It's officially one of my favorites so far and I'm also hoping to read more from Parr in whatever genre!